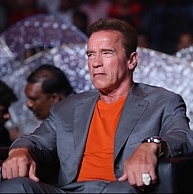 Arnold shoots a letter to Aascar Ravichandran ! All the hoopla that surrounded the sudden exit of macho-man, action hero of the century Arnold Schwarzenegger from the I- Audio launch, will be put to rest after this letter, which has been sent to media outlets now. Addressing Aascar Ravichandran, the 7 time Mr.Olympia winner writes a letter stating, "Thank you for everything and you did make my visit to Chennai such an incredible success. From the moment I arrived, everything was taken care of and I was blown away by your hospitality. From the incredible hotel to the delicious food, everything was just perfect. But the icing on the cake was the event. I have been to the Oscars and the Golden Globes and every event you can imagine. Let me tell you something - they can all learn from how you stage a production. Such a token of appreciation establishes the courtesy and reciprocity the Hollywood Superstar has. The whole 'I' factor has just created magic all over the world. People looking for online information on Aascar Films, Aascar Ravichandran, Arnold Schwarzenegger, Chiyaan Vikram, I, I audio launch will find this news story useful.